HOUSTON, April 10, 2008 - STC Management LLC, owned by Bob Sanders, Dusty Shipley, Gene Tunelle and Chris Burns, was named Franchisee of the Year at the 2008 Jiffy Lube International Convention & Trade Show. The winners were honored along with other outstanding franchisees and employees at the four-day conference held in Colorado Springs, Colo. last month. All winners exemplified the 2008 Convention theme of Mission: Peak Performance. Based in Woodbridge, Va., the owners STC Management, LLC were recognized for optimal sales performance, successful implementation of new systems to improve its business and accomplishments in the areas of training and certification. The honorees also actively particpate in their community with local programs including a high school safe driving program and breast cancer awareness initiatives. "It brings us great pleasure to present STC Management, LLC with this prestigious award because they embrace and live the values of the Jiffy Lube brand and consistently perform at a high level," said Luis Scoffone, president of Jiffy Lube International. "Bob, Dusty, Gene and Chris ensure their employees receive great training, arming them with the skills and tools needed to be successful. And they continually strive to provide an enjoyable and memorable experience for their customers." Jiffy Lube International recognized many other exceptional franchisees during the annual President's Dinner. The Presidential Recognition Award, given to a store manager for outstanding achievement in training, operations and customer service, was presented to Rex Ransom with Orman, LLC. The Harold Burney Award, honoring a franchisee who has shown hard work and dedication to Jiffy Lube and fellow franchisees, was awarded to Keith Mortensen with Lubricar, Inc for his collaborative spirit and willingness to test new systems. The Arlene Karlson Heart and Soul Award honors a late franchisee known for her compassion for her employees and meaningful contributions to the community. The award, presented annually to a franchisee that exemplifies the admirable qualities and spirit that Arlene possessed, was given to Marc Fanticola of MC LLC. Fanticola created "Matthew's Fight for Sight," a program that raised more than $100,000 to fight retinoblastoma, a rare cancer of the eyes that afflicts children. Two franchisees were also recognized for stores with the highest vehicle counts for 2007. Tom Hoffman, Sr. and Tom Hoffman, Jr. with Hoffman Development took the third and second place awards, while Tom Ito, Jean Ito and Myles Tsukamoto with Hawaiian Jiffy Inc. were presented with the first place award. "We're proud of all of our franchisees for their remarkable accomplishments," said Scoffone. "Their proven dedication to their service centers, employees and customers continues to enhance the Jiffy Lube experience, and we're honored to have them in our system." People: Kirk Umphrey of Lube Management Corporation was recognized for the great benefit programs he offers his employees. Customer Excellence: Joel LaMothe with AFML, Inc. was recognized for his high percentage of customer returns and reputation for outstanding customer service. Operations: Dave Griffin with Griffin Fast Lube, LLC was recognized for his strong commitment to training, certification and compliance with Jiffy Lube standards. Fleet Growth: Chad Weisbeck with Bronco Lube, LLC was recognized for his incredible local fleet sales growth. Facilities: Jeff and Wade Gordon with J&G Lubrication Company were recognized for the exceptional interior and exterior appearance of their service centers and customer-focused amenities. To find your local Jiffy Lube location, visit www.jiffylube.com/locations. Photos of award winners are available upon request. 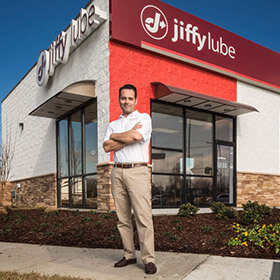 Jiffy Lube International, Inc., with more than 2,200 franchised and company-owned service centers in North America, serves approximately 27.5 million customers each year. Jiffy Lube pioneered the fast oil change industry in 1979 by establishing the first drive-through service bay, providing customers with fast, professional service for their vehicles. Headquartered in Houston, Jiffy Lube International Inc. is a wholly owned, indirect subsidiary of Shell Oil Company. Visit www.jiffyLube.com to learn more about Jiffy Lube and vehicle care. This announcement contains forward-looking statements, that are subject to risk factors associated with the oil, gas, power, chemicals and renewables business. It is believed that the expectations reflected in these statements are reasonable, but may be affected by a variety of variables which could cause actual results, trends or reserves replacement to differ materially, including, but not limited to: price fluctuations, actual demand, currency fluctuations, drilling and production results, reserve estimates, loss of market, industry competition, environmental risks, physical risks, risks associated with the identification of suitable potential acquisition properties and targets and the successful negotiation and consummation of transactions, the risk of doing business in developing countries, legislative, fiscal and regulatory developments including potential litigation and regulatory effects arising from recategorisation of reserves, economic and financial market conditions in various countries and regions, political risks, project delay or advancement, approvals and cost estimates. Please refer to the Annual Report on Form 20-F for the year ended December 31, 2004 (as amended) for a description of certain important factors, risks and uncertainties that may affect the Shell Group's businesses. Neither Royal Dutch Shell plc nor any member of the Shell Group undertakes any obligation to publicly update or revise any of these forward-looking statements, whether to reflect new information, future events or other information. The United States Securities and Exchange Commission ('SEC') permits oil and gas companies, in their filings with the SEC, to disclose only proved reserves that a company has demonstrated by actual production or conclusive formation tests to be economically and legally producible under existing economic and operating conditions. We use certain terms in this presentation, such as "expected producible resources" and "amount of reserves we expect to produce", that the SEC's guidelines strictly prohibit us from including in filings with the SEC.